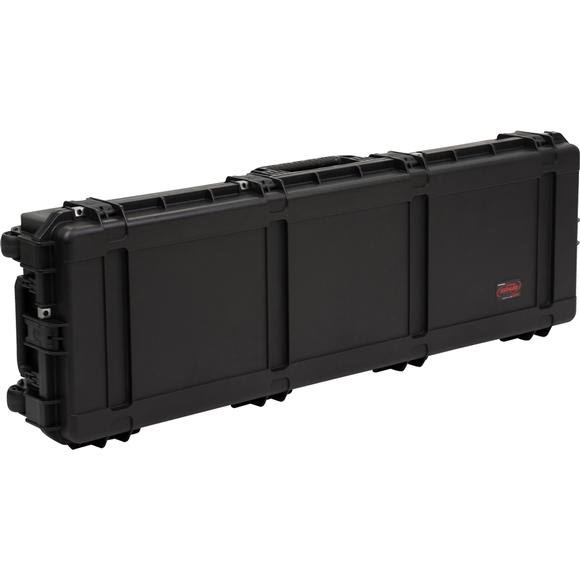 The 6018-8 Long Gun Case is injection molded from ultra high-strength polypropylene copolymer resin, material specified by the U.S. military for cases and containers. It features a gasketed, water and dust-tight submersible design, meeting military standard MIL-C-4150J. The 6018-8 Long Gun Case is injection molded from ultra high-strength polypropylene copolymer resin, material specified by the U.S. military for cases and containers. It features a gasketed, water and dust-tight submersible design, meeting military standard MIL-C-4150J. The automatic ambient pressure equalization valve self-regulates for different altitudes meeting military standards MIL-STD-648C and IP67. The 6018-8 is comfortable and durable in transport and secure and stable in storage thanks to SKB&apos;s interlocking case design. With six padlockable eyelets, the 6018-8 is completely secure. Measurements 62.7" x 20.6" x 9.6", Interior: 60" x 18" x 8"